In the battle against axillary hyperhidrosis and ordinary sweating, we've been tricked by an excessive number of "wonder cures" and hyperhidrosis surgeries that simply don't work. It's important to spare individuals from spending on items that overpromise and under deliver. We have spent many years of hard work (and labor) into perfecting the design of our undershirts. Using Multi-Patented Fabrapel Fabric which is water and stain repellent plus Anti-Bacterial no one will see you sweating yet you will stay cool on the inside. Our integrated sweat proof barrier shields absorb sweat using a 4 layer system. Within the layers is a comfortable nylon mesh transfer layer at the top followed by a layer of double napped cotton which absorbs perspiration. Next is a soft urethane barrier that eliminates cracking and peeling and finally a soft, cool cotton layer at the end. If you're looking for a shirt that will totally conceal underarm sweat, our undershirts with Dry Zone technology is the only sweat shield barrier verified to do the trick. Our undershirts are not moisture-wicking like other shirts that simply push sweat outward and do not protect against embarrassing wet marks. We designed our sewn-in sweat shields to absorb sweat and keep you dry. Any sweat that is left against the skin will keep you cool and hydrated. This is a process called Thermoregulation. Our patented Fabrapel fabric will not show any sweat on the outside and not cause any embarrassment for you. These undershirts are machine washable 100 times. One the exciting aspects of our undershirts is in the design of the shirts themselves . We have worked on many different designs over time and part of our patented technology includes the sweat shield design and stitching. Customers like the fit of our undershirts and many say our shirts “feel much neater” than others like Thompson Tee. In reference to the Thompson Tee, another customer noted, “the thickness of Kleinert's undershrits was not uncomfortable or bothersome, like theirs that made me feel like I had pads under my arms". We’ve designed our shirts to be comfortable and convenient so you can concentrate on the important things in life instead of worrying about sweat stains. After 120+ years in the garment industry, our U.S-made shirts at a lower price point than competitors. Our efficient cutting design also minimizes fabric waste, meaning we can purchase less material and pass the cost savings onto customers. We designed our underarm barrier shields to use the same sweat shield design on both sides for functional use and practicality. The way they are sewn-in helps in capturing sweat and keeping it there until it evaporates. With the overall body of the shirt using Fabrapel no sweat is shown on the outside and the shields keep sweat in. We designed our shirts with extra length to ensure they stay tucked in without bunching. Other undershirts like Thompson Tee and Sweatshield have extra length, but they can be longer than Kleinert's. People have varying fit and style preferences when it comes to sweat proof undershirts. So we created crewneck, V-neck and deep V-neck options in two colors and 6 sizes. 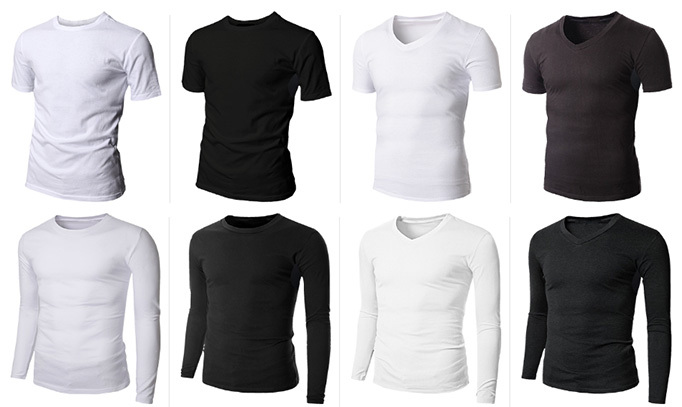 We offer the largest selection of sweat proof shirts to appeal to every fit and style need. We stand by our products and we're here to help people enjoy their lives. That's why we invested in honing our design and patenting our sweat proof technology. Nothing excites us more than hearing how Kleinert's has changed people's lives for the better.